So, be honest, when you saw the title True Believers, did you expect this series to be about a small group of counter-culture "warriors of the information age," dedicating their lives to revealing every last lie, conspiracy and cover-up on the planet? If so, good for you… myself, I was expecting some kind of goofy buddy road trip, hitting the roads in search of a mythical golden Stan Lee statue or something. But nope, it's conspiracies, lies and cover-ups, like The X-Files, only with a decidedly superheroic flavor. But the surprises aren't simply relegated to the book's theme. Writer Cary Bates is using this series as an opportunity to poke and prod at a heretofore-unexplored segment of the Marvel universe. 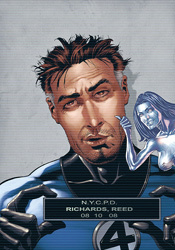 This issue wastes little time in letting its readers in on that fact: its cold open features scenes from a leaked DUI video starring a (literally) wobbly-legged Reed Richards. The message rings loud and clear: if we're going to dig deep into the secret scars of Marvel's superhero community, nothing can be sacred. Even one of the publisher's most respected and honored characters. While those ambitious first few pages set the stage for something truly original, the follow-through proves to be somewhat of a let down. After its shocking first few pages, True Believers loses its nerve. It regresses into a simple mystery story, and its quick solution leaves lingering questions about the significance of the case in the first place. The issue is overfilled with dialog, half of it needless, and outside of a heavy-handed accent here or there, I had trouble distinguishing one character's personality from the others'. The actual squad of True Believers only appears for a brief segment, coming and going so quickly they felt like guest stars in their own series. As long as Paul Gulacy's artwork focuses on True Believers' cast, it resides somewhere between good and very good. He tries something new with every page, whether it's a challenging camera angle, an original texture or an entirely different illustration style, and while that often reveals his weaknesses, it also unveils a variety of strengths that I otherwise wouldn't have credited him for. Gulacy can't draw a car to save his life, but he can effectively use pointillism to indicate a change in lighting and atmosphere. He channels Jae Lee, Eduardo Risso and Tony Harris, all within a three page span, and while some of those homages are more successful than others, it's a change to see this kind of public experimentation. It's not the best-looking series on the market (Gulacy's Ben Grimm is just plain terrible) but it's something different, which is in keeping with the title's theme. There's room for a series as ambitious as True Believers would like you to believe it is, this issue's opening pages prove that, but it really needs to commit to that direction and stick with it. Instead of the ballsy, nothing-sacred image that this series projects for itself, it's really just a new coat of paint slapped on top of an old jalopy. Original concepts are where this series shines, but when it's time to follow up, it loses its nerve. Flip through it for Reed's joyride in the Fantasticar, but don't bring it home with you.